“This is my first time to El Paso and Juarez and I’m just so delighted by realizing how close these cities are with each other,” she said. “Families are on both sides crossing all the time, and culture is crossing all the time. Stephens was visiting the borderland for La Frontera: Art+People+Place, a two-day convening on arts in border communities presented by the El Paso Museum of Art and the Museo de Arte de Ciudad Juarez. 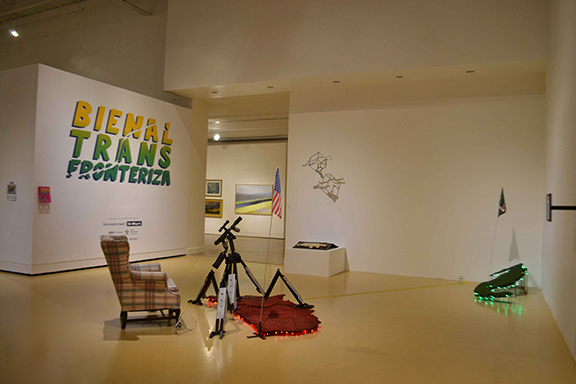 The Sept. 7-8 event was part of the fifth Transborder Biennial 2018 exhibition, which featured the work of 32 contemporary artists that live across the U.S.-Mexico border. 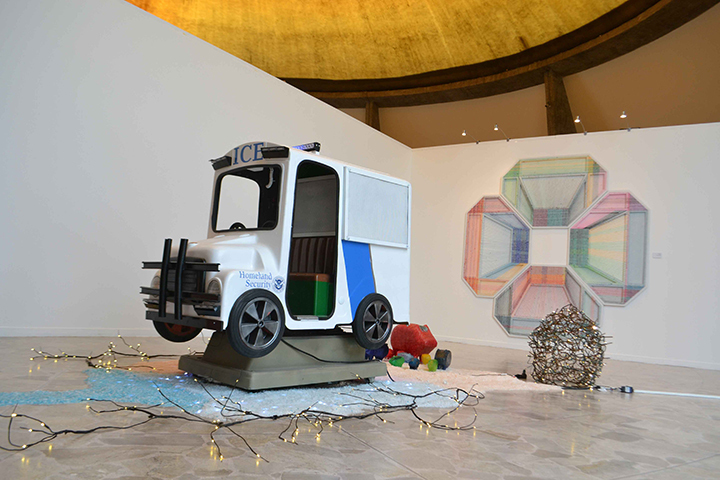 Shannon Connelly, art historian at the El Paso Museum of Art, said that working on La Frontera and the Biennial project helped her understand border culture in a new way since moving here in January from New York. “This is something that I didn’t grow up with, and for the museum this is just an amazing opportunity to represent what is art in the border and spreading the notion of what the border means,” she said. Arts discussion panel at La Frontera at the El Paso Museum of Art. 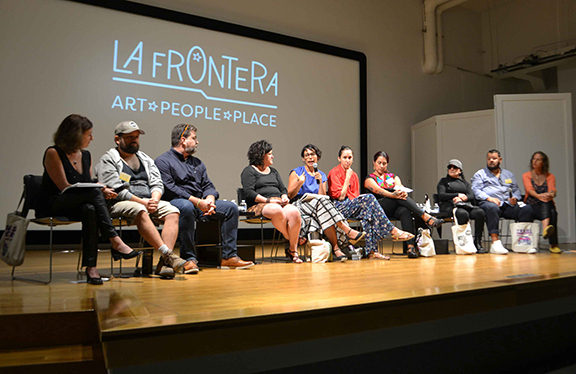 La Frontera offered combination of arts tour and a series of panels with artists and community members. In addition to discussing the arts, La Frontera also was an opportunity to learn about cross-border opportunities for creatives. 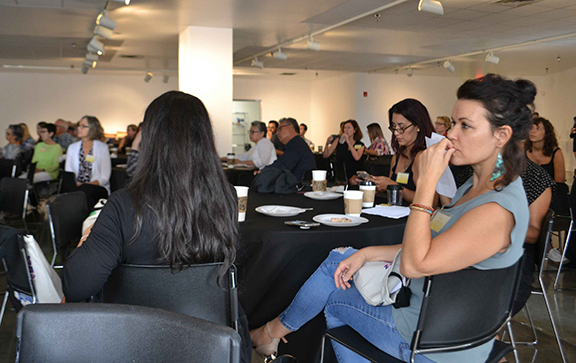 Mary Stephens listens during the welcoming breakfast for the La Frontera convening at the El Paso Museum of Art. Seeing the dynamics of sister cities bridging an international boundary shifts perspective past divisions and brings into focus shared values and interests, Stephens said. While the La Frontera art tour was eye opening for visitors new to the borderland, Juarez art student Alexandra Rodriguez found it to be a unique – but incomplete – experience of what the border really is. “Even when they went to Juarez, they didn’t really go to visit Juarez. They took a bus they went to two museums and all in group because they’re afraid,” said Rodriguez, who studies visual arts at the UACJ (Autonomous University of Ciudad Juarez). 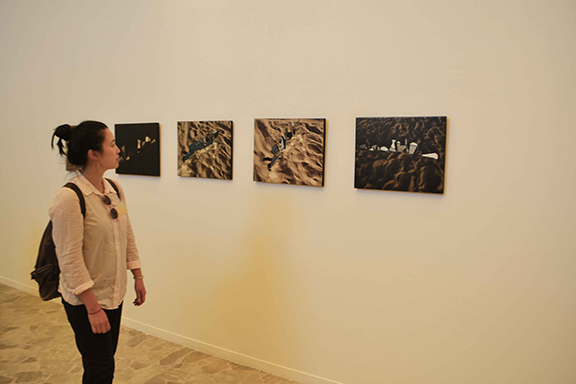 A participant of the La Frontera experience browses an exhibit at the Museo de Arte de Ciudad Juarez. Over 100 people attended the La Frontera convening. They were taken by bus from EPMA to Ciudad Juarez. The first stop was for lunch at Viva México, a restaurant in the ProNaF entertainment district. That was followed by a trip downtown to El Museo de la Revolución Mexicana (Museum of the Mexican Revolution) and the iconic Our Lady of Guadalupe Cathedral Cathedral. 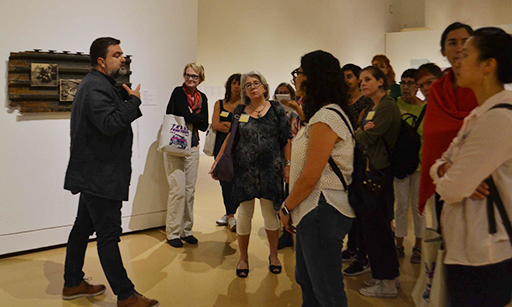 The next stop was at the Museum of Art of Ciudad Juarez, where guests enjoyed of the second part of the Biennial exhibition and panels with the artists. The second day was spent in El Paso, where participants rode bikes on a tour of downtown murals, followed by workshops and more art panels. Carlos Palacios discusses some of the art work at the El Paso Museum of Art. Rodriguez believes art events like this are a great start for giving insight on life on the border. “Something that I love about living in this community is that we’re from both sides because it’s a huge cultural influence, and ‘La Frontera’ and the ‘Biennial’ share that collective sentiment of what the border is,” she said. Still, Rodriguez regrets that since some people can’t cross from Juarez to El Paso and vice versa, they aren’t able to appreciate the experience on both sides. For her part, Connelly said she tries to immerse herself more into border life by walking from one place to the other every time she crosses between countries. “It reminds me a lot of walking between Brooklyn and Manhattan, except there’s a militarized border. It’s been powerful and moving and it changes my thought about border towns,” she said. Claudia Flores Ramirez is a multimedia journalism student at UT El Paso.